One of my favorite things about preparing a tried and true “Classic Family Recipe” are all of the wonderful memories that come flooding back to me once those familiar smells fill the kitchen. I think it’s amazing how one recipe can take you for a sudden trip down memory lane, and help you recall some truly special moments. I had one of these memory smacks a few days ago, when I was preparing my all time favorite cookie, my Grandma Viola’s Ginger Snaps. That cookie jar was one of the first things I looked for upon arriving at my grandma’s house. After getting my big wet grandma kiss, I would head into the kitchen, look up over the counter, and cross my fingers that she would have her ginger snaps waiting for me. Those cookies were the ultimate treat; perfectly chewy on the inside, a slight crunch on the outside, and a beautiful crackle running through each cookie, which shimmered from a sprinkling of white sugar. I could eat dozens of those cookies, and no one could make them better than my grandma. It’s funny how certain memories stand out like perfect photographs in your mind. When I think of visiting my grandma’s big white house as a child, there are a few of these random memories that remain crystal clear, almost as if they happened just moments ago. I can remember swinging on this creaky old swing that she had hanging off of the end of her clothes line. I remember digging deep in her closets upstairs, searching for an old game or a set of toys that my dad used to play with. I remember waiting for the mail man to come, because her house had a mail slot in the front door, and she didn’t have to walk all the way out to the mail box! I remember playing down in her basement and crushing old soda cans on a stump with a big wooden mallet that my grandpa had made. And finally, I remember her big brown glass cookie jar. All of these wonderful memories came flooding back to me last Wednesday when I was making my grandma’s cookies, which inspired me to share this recipe with you. I hope that you will give it a try and perhaps create some new memories of your own around these cookies. 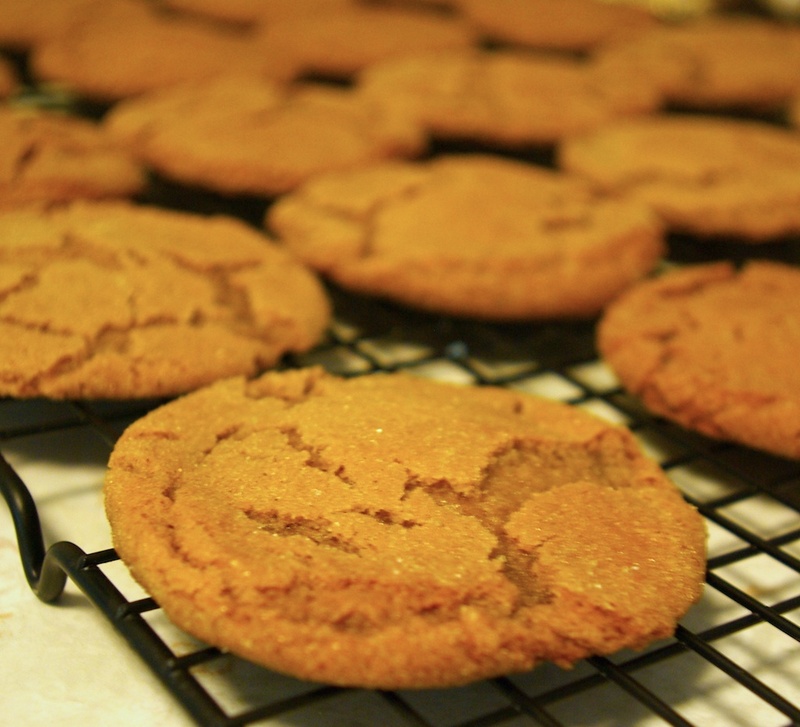 Just be sure and follow the recipe and instructions to a “T,” because you cannot improve on perfection, and my Grandma Viola’s Ginger Snaps are just that. Enjoy! Bake cookies at 375 for 8-10 minutes, cookies will begin to crackle. This is the perfect amount of time for a slight crunch on the outside, yet still chewy on the inside. If you prefer your cookies crunchy all the way through, leave in the oven for a minute or two longer. When removing cookies from oven “give the cookie sheet a good whack on the counter” to flatten the cookies and create more crackle on the top. (Quoted directly from grandmas recipe) This is an important step, don’t skip it! Allow cookies to cool on cookie sheet for 1-2 minutes, then transfer to a wire rack to cool fully.